My patron saint (the predecessor of my name saint and to whom I feel a greater affinity) used to spend Lent each year on Caldey Island, which lies three miles off the Pembrokeshire coast. 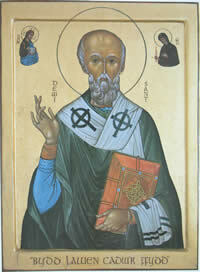 He ordained its second Abbot, St Samson, to the diaconate, priesthood, and episcopate. He probably never imagined that the monks of Caldey would support themselves by e-commerce. Now the monks have wireless broadband. Yes, even monks move along with the times. Or they see the temptation placed before them by big red, in the dial up…it leads to loss of patience, therefore one removes the temptation! Even a rustic Luddite like myself made the move from Dial-Up to Wireless this year. Now I can read MORE esoterica FASTER! DD2 sent me an email about it this morning. It has made me want to go back there soon ………. I saw just now that you had posted about it on your blog. I would like to go back there again as well.